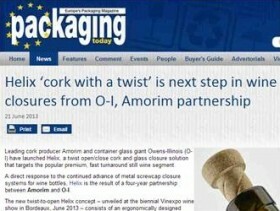 Leading cork producer Amorim and container glass giant Owens-Illinois (O-I) have launched Helix, a twist open/close cork and glass closure solution that targets the popular premium, fast turnaround still wine segment. A direct response to the continued advance of metal screwcap closure systems for wine bottles, Helix is the result of a four-year partnership between Amorim and O-I. The new twist-to-open Helix concept – unveiled at the biennial Vinexpo wine show in Bordeaux, June 2013 – consists of an ergonomically designed stopper made from cork agglomerate, in combination with a glass bottle with an internal thread finish in the neck to match grooves moulded into the cork. As well as dispensing with the requirement for a corkscrew to open a wine bottle, Helix allows the consumer to easily reseal the bottle, creating an airtight barrier with a simple twist of the cork. “We are delighted to offer the market not only a 100% renewable, modern product, but also a solution that enhances the wine drinking experience through opening and resealing convenience,” adds Amorim. According to the companies, Helix can be quickly and easily implemented by wineries with only “a minor adjustment” to existing filling lines. The results of “extensive testing” by Amorim and O-I are claimed to show that wine packaged in Helix glass bottles with cork stoppers showed “no alteration in terms of taste, aroma or colour”. As part of the four-year development process, market research in France, UK, USA and China is also said to have revealed “great consumer acceptance” of Helix for fast turnaround and popular premium wines. Consumers also appreciated the retention of the festive ‘pop’ associated with opening a bottle of wine, the companies say. “The future of innovation is through collaboration,” says O-I European president Erik Bouts.